The Lampang River Lodge offers 60 beautifully decorated Thai style bungalow houses, 6 km south of Lampang city, on the bank of the Wang river. Accommodations are set in beautiful natural surroundings. All rooms are fitted with air-conditioner, private bathroom and all basic facilities. Dinner and breakfast are served in the main restaurant. �Sala sunset� riverside area is for the evening cocktails. 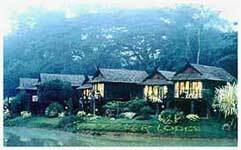 Accommodation at the Lampang River Lodge is an unusual "Thai" Experience, away from the big city and concrete jungle. We offer foreign visitors a glimpse of Thai Life in relative comfort. There are currently (2003) 53 standard rooms and 7 superior rooms. 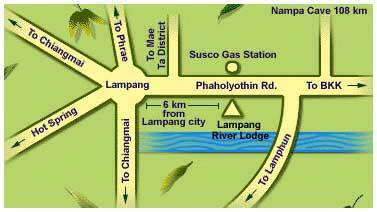 Van car transfer service from and to Lampang airport, railway station or bus station is available for a fee. 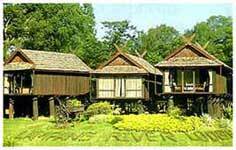 330 Moo 11, Tambol Chompoo, Amphur Muang, Lampang 52100, Thailand.